It’s an unlikely food alliance – whirlwind South Australian artisan cheesemaker Kris Lloyd and the inmates of Cadell prison in the Riverland. Together, they’re producing a premium food product which Lloyd hopes will lead to a revival in one of the oldest and simplest culinary pleasures – butter. Lloyd, the dynamo behind Woodside Cheese Wrights, has started selling cultured butter, and is one of the few Australian producers of the French-style product. It’s a very simple product – containing only cream, cultures and salt. In fact, it’s so simple that you wonder why so few people manufacture it. The cultures are her own “cocktail”, the salt is the distinctive pink River Murray type, and the cream is sourced from the dairy at the Cadell Training Centre. Cadell has had a dairy since it opened in 1961. It started selling bulk milk to distributor Falland’s, and started packaging and processing its own milk in 1998. In 2005, a policy change required the dairy to provide only low-fat milk to inmates. A separator was commissioned, resulting in the production of plenty of cream. Lloyd first heard about Cadell’s over-supply of cream years ago and, when she started to develop the notion to produce her own butter, she got in touch with the prison dairy. She now receives deliveries of bulk, unpasteurised cream – her preference. “I have control of the process – so I get raw cream and I pasteurise it,” she says. Unlike bigger players, Lloyd says she treats the cream to the minimum required to kill pathogens – any higher temperature or great length of time, and she believes the cream starts to be denatured. Once she had her cream, it was a simple process to produce butter – after some experimentation and extensive tasting of French cultured butters. She favoured a cultured butter, because of the lighter texture and the greater complexity of the flavour. She didn’t even need to buy extra equipment – an existing mixer in her cheese factory was enough to do the job. “This is such a pure product – because all it is is cream, cultures and River Murray pink salt. Full stop. There’s nothing else in it. That’s not to say there isn’t an art to the process. Variables include the kind of culture you use, the temperature, the length of time to allow the cultures to do their work, and the churning process. Over-churn the butter and the product starts oxidize. Lloyd being Lloyd, she didn’t want to stop at a pure, light, creamy butter. She started pondering ways to do some “funky stuff”. 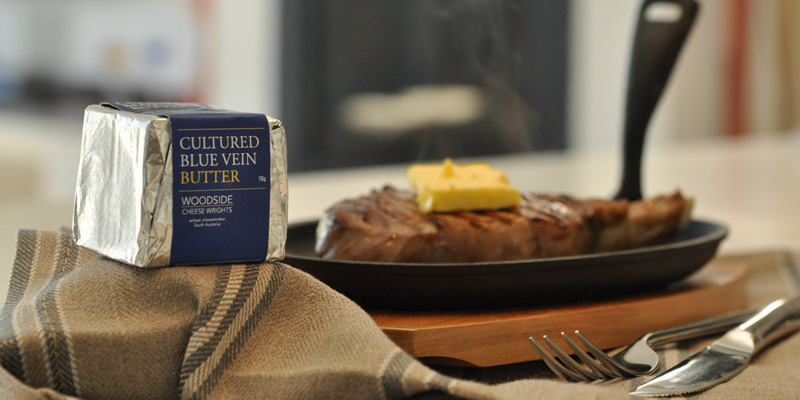 Lloyd’s “lightbulb” moment was to add blue-vein cultures to the butter. What she’s achieved is a very delicate blue-vein flavour in a butter that’s perfect for melting on the top of a steak or for sautéing mushrooms. That’s been selling well since it went on the market earlier this year, but she hasn’t stopped there. A new product about to be released is a “whiskey-washed” butter, which is very delicately scented and flavoured with single-malt whiskey. Lloyd recommends using this on pikelets with some good orange marmalade. “My sons just get slabs of it and put it on bread,” she says.